Fresh off the success of their Christmas themed live dealer casino offerings over the holidays, Playtech brings Sugarland. 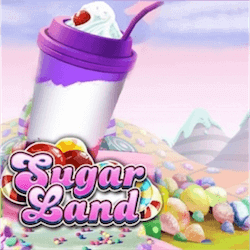 This sweet slot takes place in a colourful land of sugary treats from sweets to ice cream sundaes. This is a pretty overused theme and it has been disappointing for many Playtech fans to find that the new year kicks off with such a child like themed slot. That said there is still much fun to be had on these sugary reels. The reels are laid out in a 5×3 grid and there are an incredible 50 paylines to activate. Wagers can start as low as 0.01 but the maximum wager here is 100 making it a good game for low or high rollers. The 100 000 jackpot is pretty good too, no matter if you have a sweet tooth or not. The 96.19% RTP helps this slot compete with the other sugar themed titles out there like Candy Dreams, Reel Rush or Sunny Scoops while it’s full mobile and PC compatibility also will help spread its popularity. The special features available here are a pretty standard fare. A delicious looking chocolate ball will be your substitute wild. It only shows up on the 2nd to 5th reel so keep an eye out for it. The second bonus feature is a free spins feature. This feature activates when the chocolate slab bonus icon lands on reels 2, 3, 4 or 5. These chocolates are scatter icons so as long as three are present on the reels, they can land anywhere and trigger the bonus. Once this feature starts you will be able to take 10 free spins , but now there will be up to 3 extra wild icons on the reels after each spin giving you many chances to rack up some wins. There is also an additional feature where decanters filled with chocolate sauce can pour over reel icons to make them pay out more during free spins. When three decanters land on the reels the pink candy symbols become wild. When 7 of the decanters appear on the reels then the orange candy becomes a wild symbol plus you get 3 additional spins to take. If you manage to land 12 of the chocolate sauce decanters the green candy symbols become wilds and you get 2 additional spins.